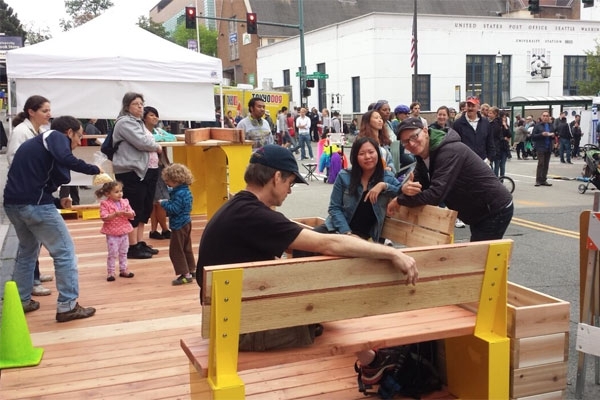 Watch a fun time lapse video of part of the construction of our parklet during the U District Street Fair. 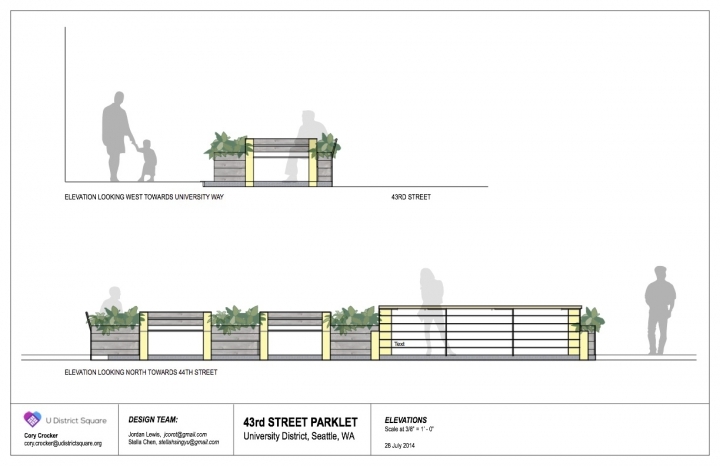 The site for the first parklet in our neighborhood will be where the Ave meets NE 43rd Street, in the heart of our community. 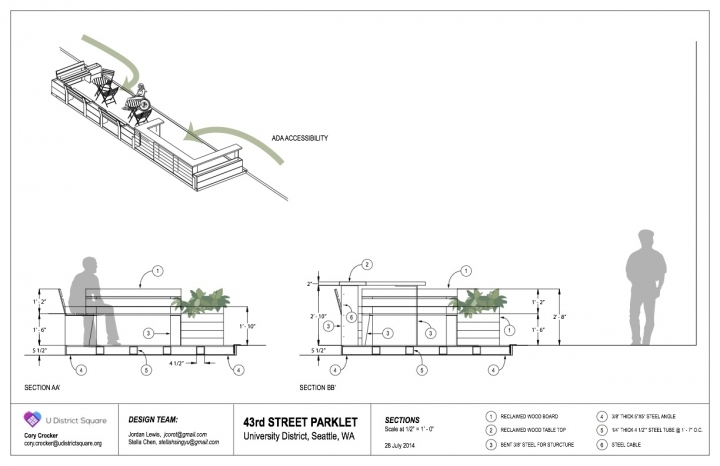 The parklet will be 8 feet wide and 30 feet long and provide bar seating, benches, planters, and space for tables and chairs. 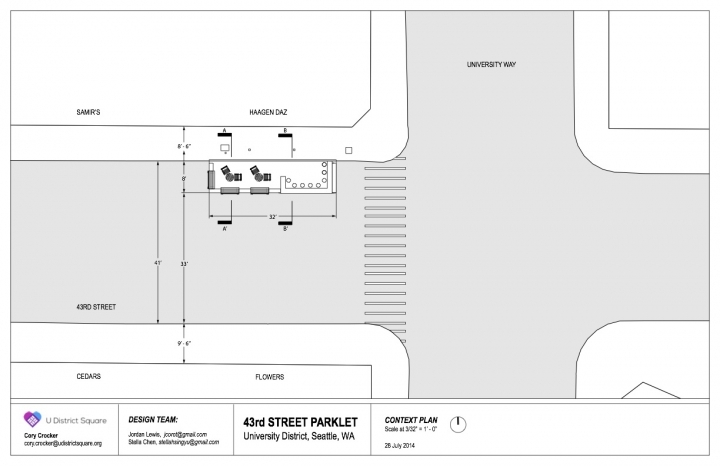 You can view plans below. 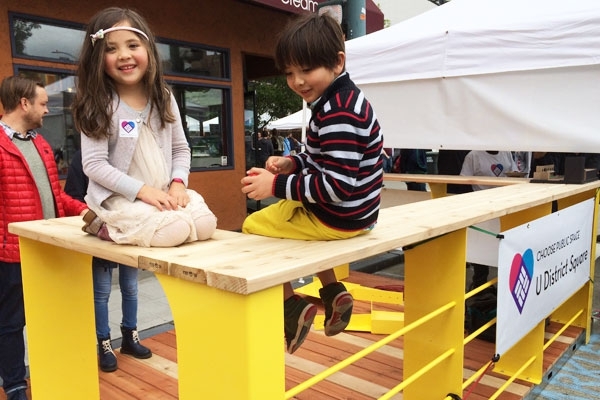 Our parklet is unique in that it is placed in a street that will be half closed to traffic for the next seven years during the construction of our light rail station. 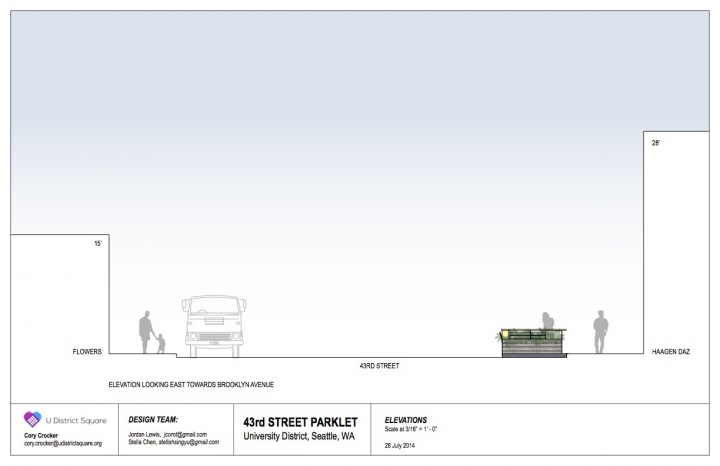 As a result, our parklet is wider than most and benefits from a pedestrian-zone perimeter for better safety. 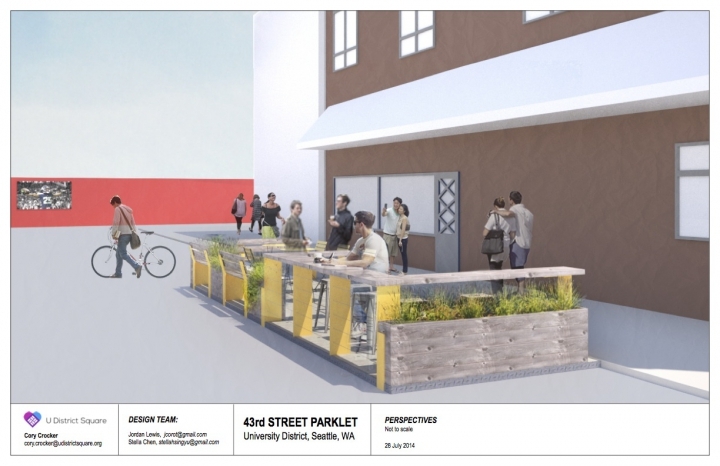 Arriving at the same time as our parklet will be a new bike share station immediately adjacent for a synergy of bike and pedestrian activity. 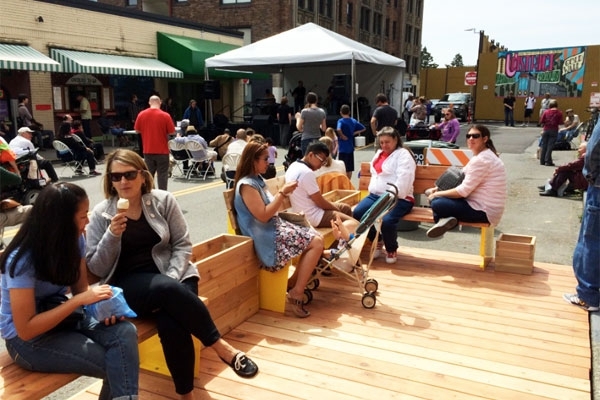 The Seattle Department of Transportation selected our neighborhood to participate in their pilot parklet program this year and we recently were awarded partial funding for the parklet from the Seattle Department of Neighborhoods. 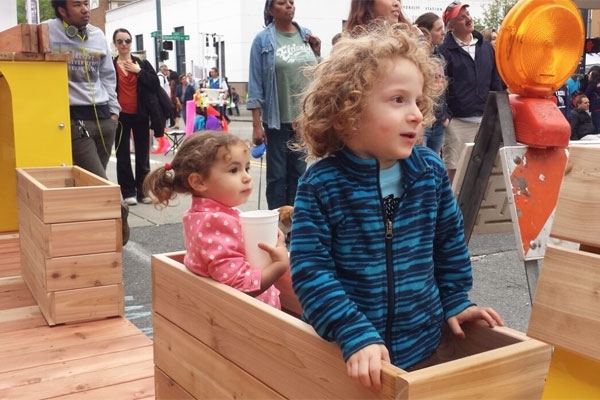 We need to match this $8,000 grant with volunteer hours and community funding to the estimated amount of an additional $6,000. 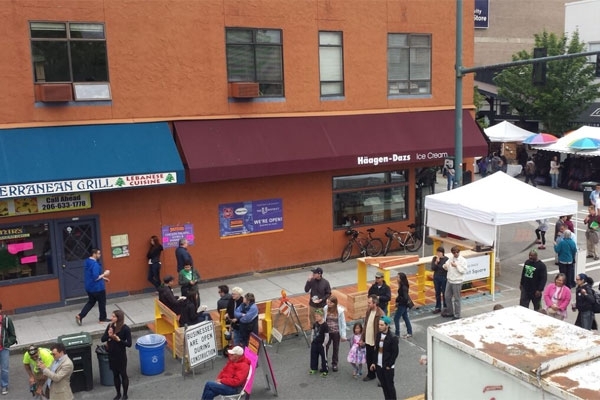 In December of 2015, we moved the parklet to a better location and a very enthusiastic sponsor at Bulldog News, when the corner ice cream shop owner at the original site became unsupportive of public open space. 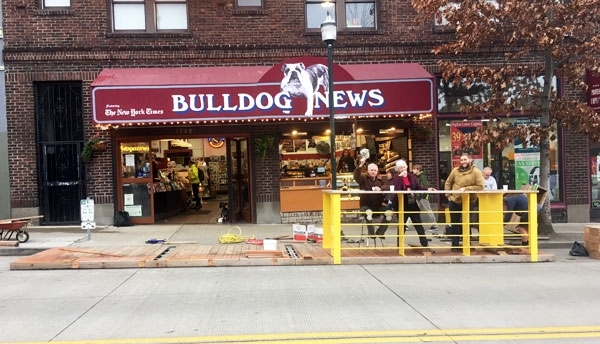 Bulldog News generously paid the new permits fees and re-construction costs. 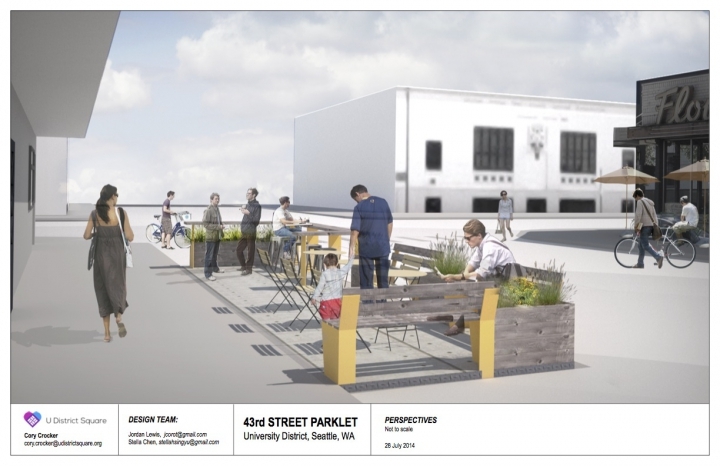 Please consider visiting the parklet soon and patronizing our new sponsor. 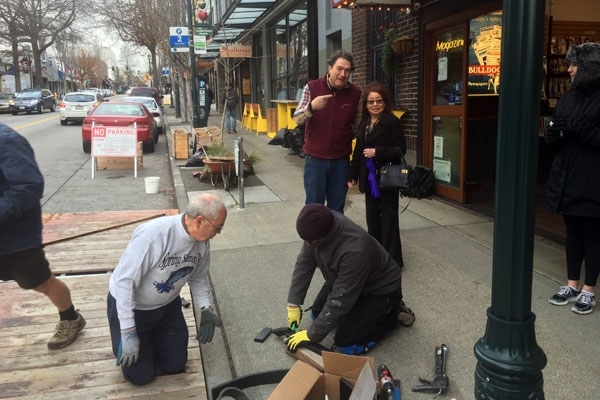 Re-assembling the parklet at its new location by neighbor volunteers. 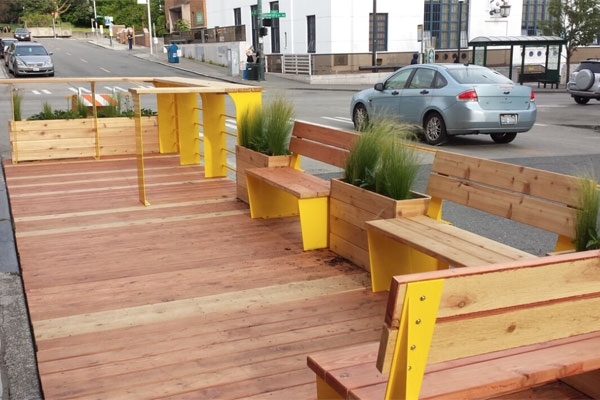 On Monday, June 29th of 2015, we hosted our official ribbon-cutting celebration with Mayor Murray and a host of other supporters who made our parklet a reality. 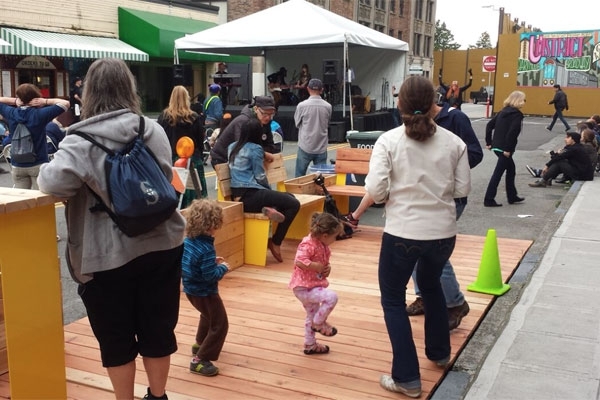 It was a sunny, summer day and a perfect time to enjoy music with neighbors and invited guests at our new parklet. 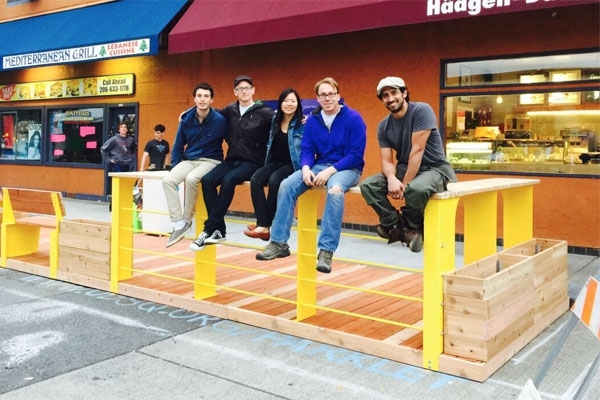 Overnight, our parklet was assembled and introduced just in time for 2015's U District Street Fair. 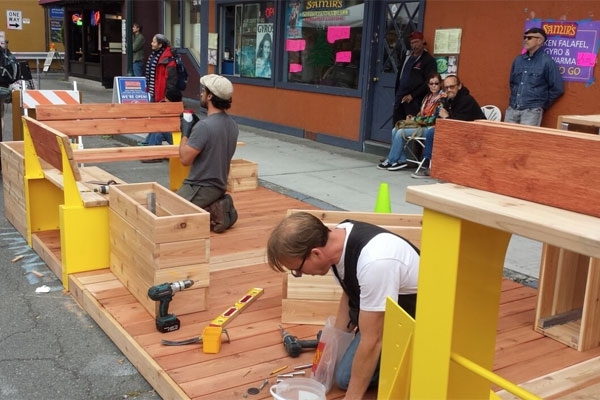 It was a joint effort with many people helping to build the parklet, just as it took the support of so many community members to raise the funds. We should all be very proud of what we built together. Now, come enjoy it! 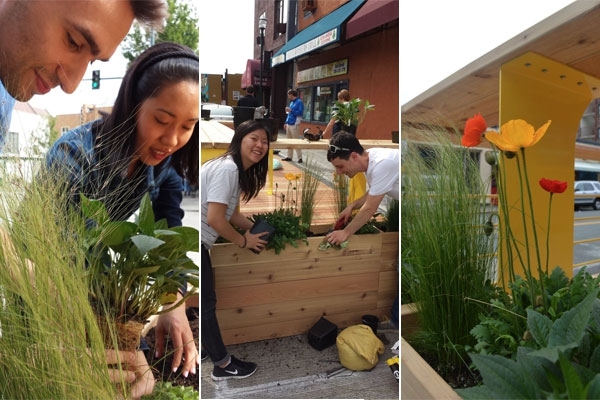 With over a hundred backers, we surpassed our fundraising goal on Kickstarter and just raised $6,500 to complement the funding we received this summer from Seattle's Department of Neighborhoods. 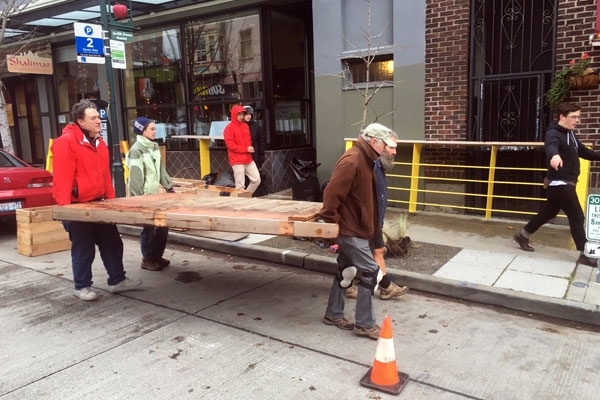 Thank you for making this happen with your generous support. 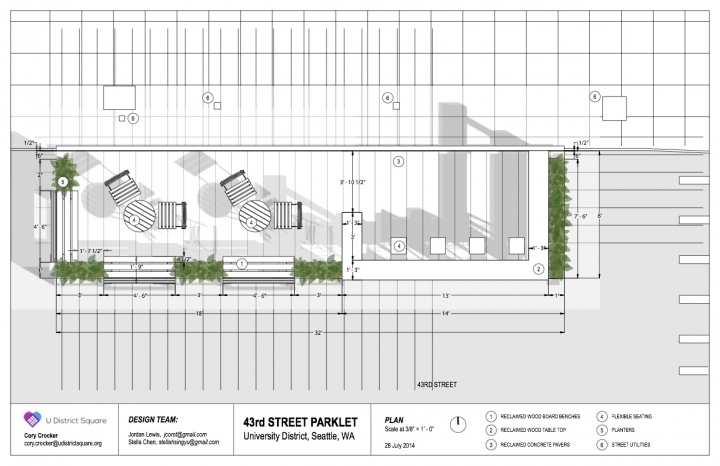 We submitted our design drawings to the Seattle Department of Transportation for review, community comment, and permitting on August 6th.